These three issues were a key part of Abbott’s 2013 election campaign. According to Abbott, the mining and carbon taxes were devastating the nation. And stopping asylum seekers was imperative to save lives and protect our borders. These were his top priorities – the dragons threatening our nation must be slain. On day one he would stop the boats and introduce legislation to repeal the carbon tax – to be followed by the mining tax within 100 days – thereby single-handedly saving us all. It seems fairly clear that Tony Abbott is staking both the credibility and the value of his government around these three key actions, and that he believes they are the criteria by which we should judge his success for the next election. So let’s have a look at what he has really achieved – and who the real winners and losers are. Slaying not just one tax dragon – but two! Certainly sounds good – and according to Tony Abbott, it’s a BIG win for the Australian people. But does that stand up to scrutiny? The Minerals Resources Rent Tax was a levy on ‘super profits’ from the mining of iron ore and coal. It was only applied to companies whose annual profits – profits, not revenue – were in excess of $75 million. It was introduced on 1 July 2012 by the Labor government and repealed by the Liberal government on 2 September 2014. Prior to ‘axing’ this particular tax, the Abbott government argued that the mining tax had to go because it destroyed foreign investment and cut jobs. Once repealed, Abbott stated that the “big flashing red light over investment in Australia” is now gone. So if Abbott was right, investment in Australia should both have dropped during the time of the mining tax, and picked up since it was repealed. It turns out that this was just another piece of Abbott-Speak or ‘truthiness’ that doesn’t stand up to scrutiny. In fact, as ABC business editor Ian Verrender argued recently, if the very similar Petroleum Resources Tax introduced over 25 years ago is anything to go by – which had minimal if any impact on jobs or investment – the Mineral Tax would also have had little or no impact on either investment in Australia or Australian jobs had it been left in place. The reality is that mining companies aren’t all that mobile in their location choices – unlike car companies who can manufacture anywhere, mining companies have to mine where the resources are. So who are the real winners and losers from the repeal of the Mining Tax? 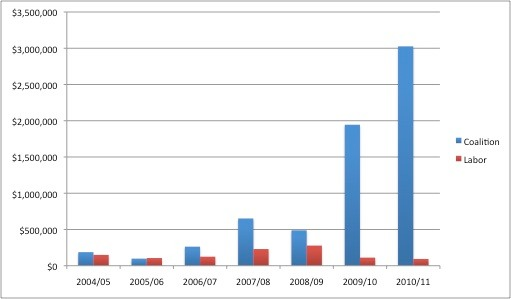 The largess of the mining sector towards the LNP continued post 2012. There was over 1.8 million given to the Liberal and National parties in the 2013/2014 financial year from resource and energy companies. By way of contrast, around $450,000 was donated to the Labor party from the same sector over the same period. And then, of course, the other obvious big winners from the repeal of the Mining Tax are big mining companies themselves. Certainly, if the level of their donations is anything to go by, there were a lot of mining companies (and related suppliers like marine dredging operators) out there who were very happy to see the LNP – with their commitment to the repeal of the mining tax – win the 2013 federal election. There is a fairly simple but often misunderstood fact about Australia’s mineral and resource wealth, and that is that with limited exceptions, mineral (and other) resources under the soil belong to the Australian people. They’re ours. Well technically they belong to ‘the crown’ (or in this case, the state governments) – but same thing. Unlike in countries like the USA, where a gold nugget you dug up in your backyard would belong to you, in Australia, everything under the ground belongs to all of us. ‘We’ then licence the rights to mining companies – like Shenhua and Hancock Prospecting – to extract those minerals (or other resources). This arguably makes taxing mining (and resources) profits different to taxing other companies, because they are making profits from something that belongs to us. It’s literally Australia’s family silver. Once it’s sold, it’s gone. When you take that into account, you could argue that the mining tax is closer to a profit share arrangement than a tax – because it’s about what portion of profits made from our mineral wealth should go to mining companies (who are 83% foreign owned), and what portion should go to us. In 2001, the split was roughly 60/40 – 60% to the mining companies and 40% to us. But now, it’s closer to 80/20 – 80% to the mining companies and 20% to us. The mining tax sought to redress some of that imbalance – although arguably not as well as it could have, thanks to the watering down it got prior to its implementation – but that’s another story. Conclusion: The Abbott government – with some help from the Mining companies themselves – demonised the Mining Tax. It was the economic terrorist that would kill investment and jobs according to Abbott, and he and his government promised to come in and save us from this terrible mountainous dragon of a tax. But in the stark light of day, looked at this through the eyes of the average Aussie, the slaying of the mining tax is not something Abbott should be boasting about. It may have been a win for the LNP and some of their major donors, but for everyone else, we’re letting mining companies sell off the family silver without giving us our fair share. The Carbon Tax was introduced on 1 July 2012 as part of the Labor Government’s Clean Energy plan. It only impacted 260 large carbon emitters, who had to pay for their carbon emissions. The goal of the tax was to incentivise a reduction in carbon gas emissions – which it did. The tax was repealed on 17 July 2014. Of course that didn’t happen – this was yet another piece of Truthiness. 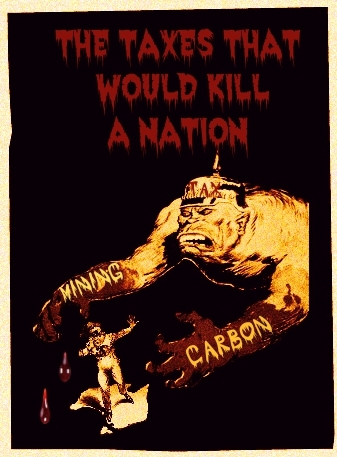 Abbott took the tiniest of molehills and created a massive mountain of fear about what the Carbon tax would do. Not only did Gladstone not close down, but there was even a great article in the Gladstone Observer in March this year entitled ‘Bring back the carbon tax‘. Leigh Sales questioned Abbott about this last week – asking him to comment on the fact that places like Gladstone, Whyalla and Geelong weren’t actually wiped off the map as he said they would be. In a rare moment of honesty, Abbott briefly conceded that Sales had a ‘gotcha’ moment, which seemed to shock even him briefly, as he then mumbled something about trying “to be as good as we possibly can be going forward”. Moreover, not only did the carbon tax not cause wide-spread job loss and economic problems while it was in place – following its repeal, we have not seen the promised increase in investment or jobs. In fact the opposite has occurred. Unemployment has continued to climb and investment to drop. So if scrapping the carbon tax was to have fixed those problems, it has been spectacularly unsuccessful. The winners: Every household gets $550 a year! Ok, not $550 – but nearly enough to buy an extra cup of coffee every week. This is partially true. As a result of the repeal of the carbon tax, prices did drop, and households will have saved some money. However, according to ABC Fact check, the amount is only $280 per year in 2015/16 and $424 per year over three years. Now before you get too excited by these savings, remember that they are expressed ‘per household’. If you convert that to a saving ‘per person’, it is closer to $110 per year next year and $165 per year over three years – or around the price of a coffee once a week. We’ve no longer got a workable climate change policy to help keep us in clean air, dry land and livable weather. We’ve gone from collecting revenue from heavy carbon emitters to paying companies for possibly, maybe, doing something about reducing carbon emissions at some point in the future. It’s no secret that Abbott is at best sceptical about the need to do something about climate change. In 2009, he said that climate change was ‘crap’. In his autobiography, he indicates that he is a fan of Australian geologist Ian Plimer whose own book argues that ‘the climate has always changed‘ and that humans are not responsible for current global warming. Interestingly, Plimer is a director on the boards of several of Gina Rinehart’s mining companies. And even more interesting, it seems that Plimer is also a fan of Tony Abbott’s – having donated a total of $97,000 to various branches of the Liberal and National parties in 2013/2014. Given Abbott’s philosophy on climate change, it’s no wonder that once elected, he set about implementing a world first – a climate change policy that actually resulted in a serious increase in carbon emissions. In fact, since the repeal of the Carbon Tax, Australia’s carbon emissions have been increasing at one of the highest rates since records started in 1990. This suggests that Abbott still doesn’t believe that cutting carbon emissions is a priority, despite the clear consensus amongst scientists that it should be. Some even think that it may already be game over. 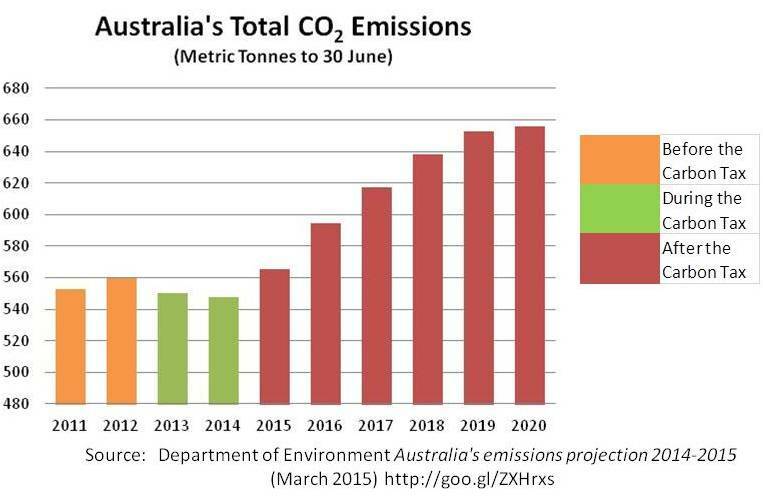 Here’s a graph of data published by our Department of Environment earlier this year showing total Australian carbon emissions just prior to when the carbon tax was introduced along with projections through to 2020. The graph shows that there was a clear drop in carbon emissions following the introduction of the Carbon Tax (the green bars). This drop in emissions immediately reversed (the red bars) after the tax was repealed, and the stark increase in emissions is expected to continue through at least 2020. The other thing that happened as a result of the carbon tax being repealed was that we went from a scheme which raised revenue by taking money from companies with high emissions via the carbon tax (some $6.6 billion in 2013), to one where we pay companies $2.5 billion via the Direct Action Scheme to commit to reducing their emissions. At some point in time. But not necessarily straight away. In fact, only 1.5% of companies who are currently participating in the Direct Action scheme are committing to reduce emissions in the next three to five years. Scrapping the Carbon Tax and introducing Direct Action has left a $7.6 billion hole in budget revenue – which is going to have to be made up somewhere. So don’t spend that $110 too quickly. Conclusion: Given Abbott’s historical position on climate change, and that his actions since being elected support increased rather than decreased carbon emissions, it’s difficult to believe his stated position last year, that he takes climate change ‘very seriously‘. Climate change is arguably the most important challenge facing our nation – and the whole world – right now. And yet our Prime Minister is making things worse and not better. The potential consequences of this, not just for future generations, but for current generations are staggering, and make the $280 per household savings seem insignificant. What use is money in the bank if the bank doesn’t have a planet to live on? But instead of focusing on the very real problem of climate change, Tony Abbott created a mountain out of a carbon-tax-molehill to scare the Australian people into believing that Australia needed to be saved from the carbon-tax, rather than from the true foe – carbon emissions themselves. He convinced people that he was the man to slay the mythical carbon-tax dragon, and completely distracted people from the thing that we should really be afraid of – climate change. Asylum seekers who arrive here by boat made up only 2.5% of people who migrated to our country in 2013 – we are not going to be overrun by them. We don’t even take our fair share of refugees – taking only 0.31% of all UNHCR refugees. Asylum seekers who come here by boat are not illegal, not queue jumping, and the vast majority are fleeing from torture or persecution and are not economic migrants. Asylum seekers are not terrorists – as a previous chief of ASIO pointed out, if you are a potential terrorist seeking to attack Australia, the very worst way to enter the country would be as an asylum seeker. The only winners I can see from the Abbott government’s Stop the Boats policy are politicians, who have turned the plight of a small number of asylum seekers coming here by boat into another mythical dragon to be slain for their own political ends. The biggest losers are of course the world’s most vulnerable – asylum seekers. Asylum seekers who have nowhere to go, or worse still – are stuck in the torturous hell-holes that are Manus island and Nauru. Or even worse, forcibly returned to the country they were fleeing persecution from – as happened this week. Yet again the Abbott government has diverted billions of dollars into conquering a molehill that their spin doctors have turned into a dragon-shaped mountain. Molehills aren’t mountains. Or Dragons. Mountains are mountains. Abbott really does seem to specialise in terrorising the Australian people by making mountains out of molehills. He finds a small but ‘credibilish’ fear and uses rhetoric to fan it into fully fledged terror. He then portrays himself as the only possible saviour of the Australian people from this mountainous mythical dragon. The three so-called ‘achievements’ discussed above are not the only ones Abbott has created dragons out of – look at the fear he has managed to generate around terrorist attacks. It’s the ultimate political spin doctoring – create a mythical dragon, fight it, and claim to have saved us from it. And the thing with dragons is that they are far easier to slay – what with them not being real and all – than actual problems. It’s much simpler to be a dragon slayer than someone who actually rights real wrongs or solves real problems. And let’s face it – it has worked. The good people of Aus have by and large been successfully hoodwinked into buying the myths. 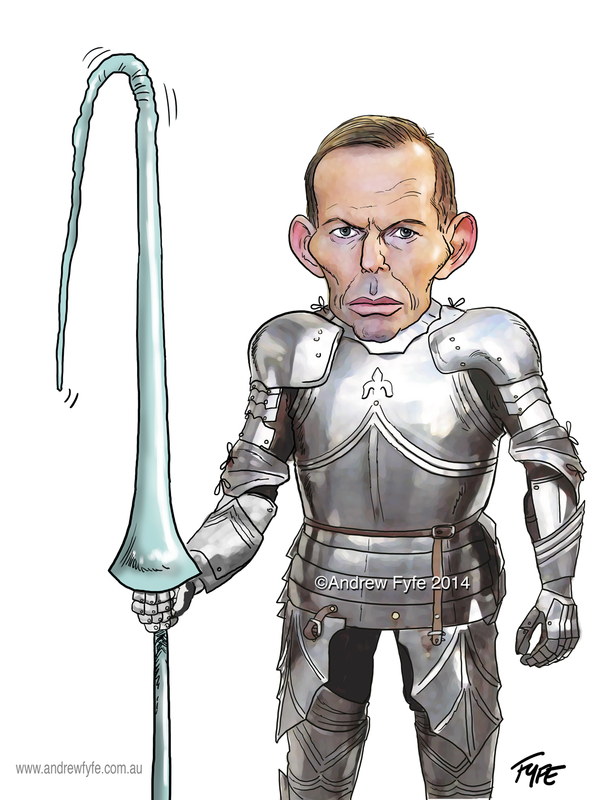 As have the media, who on the whole let Abbott’s talk of dragon slaying go largely – not wholly, but largely – unchallenged. When you look at the winners and losers from the three policies that Abbott boasts so much about – the only consistent winner is the LNP. Abbott’s main achievement has been distracting the Australian people with insignificant dragon-shaped molehills so that we won’t look at the truly mountainous problems we should be focusing on. Oh, if only you weren’t preaching to the converted … No, that’s wrong, because we never needed to be converted. I mean, who in his/her right mind could conceivably support Abbot’s LNP ??? I think even those of us who didn’t support him are still blown away by how really seriously SERIOUSLY bad he is though. Surely you mean DID support him, Kate …? Because I have detested the LNP since John Howard, and thought I would have to leave Oz if he were reelected. But I’m beginning to wonder if I won’t simply die of shame for being an Aussie if this madman gets back in. Excellent work. Thanks for taking the time to do this research. I absolutely love the use of the metaphor as well.